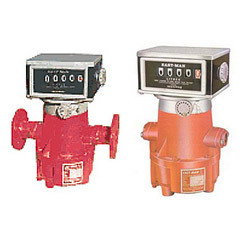 Accurate Flowmeters’ Custody Transfer Meter (CTM) is a Reciprocating Piston Type Positive Displacement, Volumetric flow meter. Employing calibrated three pistons that will not allow any by-pass, thus accurately measuring and recording each & every litre precisely of any kind of non-corrosive oil / liquid. CTM is specially designed for high-sustained accuracy and continues volumetric measurement. It is especially suited to check the Exact Receipt, Transfer, Consumption, Dispensing, Mixing and Packaging of Oils/Liquids. This unit is also widely adaptable to other various types of services. It will not freeze or air lock.